Today, the Civil War Commemorative Silver Dollar Coin remembers when officials rejected a widow’s claim for a pension on July 25, 1889 for her husband who died during the civil war. Drinking Whiskey Is Not in the Line of Duty, Therefore No Pension. Assistant Secretary Bussey has rendered a decision upon the application for a pension of the widow of Henry Taffe, late of Company F, Eightieth New York Volunteers. On March 16, 1863, Taffe and a comrade named McCloskey, at Windmill Point, VA, procured permission to visit for the night, the provost guard, about half a mile distant, on the Potomac river, they having received an invitation so to do. Upon their arrival at the post the guard, consisting of four men, including one Collins, offered them whiskey, which had been procured through an officer. They drank freely, and during the evening Taffe and Collins got into a quarrel, which was probably incited by Collins. After a bitter quarrel during the evening, they retired, but awoke during the night and renewed it. Taffe left the tent and went out into the dark, and was soon followed by Collins. The two men soon again came in contact, and, as the evidence showed, Collins bayoneted Taffe to death, there being, however, no eye-witness to the crime. Collins was subsequently tried for the murder, convicted and sentenced to be hanged. His sentence was, however, commuted to imprisonment during the war. The pivotal question at issue is whether Taffe died while in the line of duty. The Assistant Secretary, in his decision, says that while it appears that the deceased soldier and his comrade, McCloskey, made the visit to the guard post with the permission of the commanding officer, it is clear that the visit was not made in pursuance of any military duty, but simply to spend the night for personal pleasure, it being the night before St. Patrick’s Day. The permission thus given was, in fact, actual release from the line of duty for the time. They did not go to the post for any necessary purpose connected with the service, and when the soldier incurred death he was not engaged in the performance of any act growing out of or related to the line of duty in the service. The Assistant Secretary further says that even if the deceased soldier and his companion had gone to visit the guard-post on “some public duty,” or for a “necessary purpose connected with the service,” yet the fact that after reaching the post, they indulged, as is confessed, in the excessive use of drink, a violation of the discipline and honor of the service, put them outside of the line of duty for pensionable purposes. If they went by permission, in pursuance of the line of duty, they violated their duty by getting drunk and thereby unfitting themselves for executing faithfully and discreetly, as became soldiers, whatever orders were entrusted to them. In concluding his opinion, Mr. Bussey says: “Reference is made, in this appeal, to the financial needs of the claimant, and, in view of it, I deem it proper to state that, in adjudicating a claim for pension, the department is not, nor can it be, guided by such considerations. The rejection of the claim is approved. 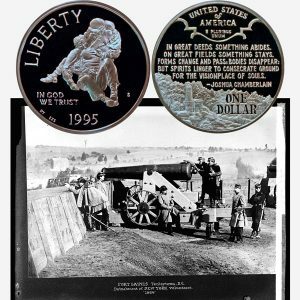 The Civil War Commemorative Silver Dollar Coin shows with an image of a detachment of New York Volunteers at Fort Gaines, Tenleytown, D.C., circa 1864.